Expect a landscape and music that brings new experiences in the 34th Suedtirol Jazzfestival Alto Adige. Each year the festival brings innovative jazz and improvised music to ancient, breath-taking locations. Last year, the emphasis was on British musicians. This year, they’re from Austria and Italy, especially appropriate as the region of Suedtirol (South Tyrol) spans the two countries - everything, including place names, is in both Italian and German. The festival centre is in Bolzano/Bozen, spreading out to towns and villages across the region, as well as wild places. You can be sure of unexpected venues. The opening gig (24th Jun) is in a concert hall made of fruit crates in the Fruchthof Co-operative in Frangarto: Kinzelbinder’s Melting Orchestra brings new jazz from thirteen musicians, incorporating Italian and Viennese folk music. You can hear several of these thirteen musicians in other gigs. Slovenian-born, Austrian resident, avant-garde singer Maja Osojnik has a solo gig on June 28th in Bolzano/Bozen (very specifically at 11.59pm!) On June 25th, Klemens Lendl and David Müller sing and play ‘recycled’ Viennese songs with trumpeter Martin Eberle. (‘Die Strottern’, in the Vigilius Mountain Resort, 1500m above sea level.) Pianist Elias Stemeseder is playing solo in Ritten on July 1st, and with the Yellow Squeeds on July 2nd in St. Lorenzen/San Lorenzo di Sebato. There’s a great feeling of all the musicians in the Festival working together on different projects. There are spectacular venues, such as the mountain backdrop to the Parco Semirurali (jazz-funksters Francesco Cusa & The Assassins, June 27th.) On the same evening, Interzone are at Fahlberg Castle, balanced on a mountain top. There are concerts in mountain refuges. For example, Cantata Viennapoli, part of the Melting Orchestra, are at the Rifugio Emilio Comici Hütte, surrounded by the rose-coloured crags of the Dolomites. (Wolkenstein/Selva di Val Gardena.) June 30th at Lake Carezza sees anarchic trumpeter Matthias Schriefl lead a band of musicality and fun. On June 25th, a two-hour hike through the Valle Isarco takes you on a Jazz and Wine Tour - vineyards, plus jazz from trio Dan Kinzelman and Beppe Scardino (saxes) and Glauco Benedetti (tuba.) There’s also (stationary) beer-tasting with Neapolitan band Crossroads Improring on July 1st in Bolzano/Bozen. Art meets jazz: the Museion (Modern Art Gallery) in Bolzano/Bozen has a full day on June 30th. Enrico Rava’s Italian guitarist Francesco Diodati meets US (Italian resident) Dan Kinzelman and Austrian pianist Elias Stemeseder. US trumpeter Peter Evans has a solo gig - it partly involves him playing along with a guided tour of the art exhibition. Trio Edi Nulz play ‘unruly chamber punk jazz,’ while Hobby Horse combine ‘free jazz, rock, and electro music.’ Sax-led Swiss quintet Christoph Irniger Pilgrim are there too on June 25th and Monk-influenced Austrian trio Flower on July 2nd. If you miss one band, you can probably catch them on another day: the brassy 9-piece Jazzrausch Streetmarching Band can be heard on a mountain train at Ritten (28th June), then in five other places on other days. The Monaco Swing Duo brings gypsy jazz to 4 venues on 5 dates in Brunico/Bruneck. Gigs in nearby towns are easy to get to - local trains are frequent, travelling through extraordinary mountainous landscapes. Merano/Meran has Italian band Slivovitz with their Balkan influences on June 29th, and Philipp Groppers Philm on June 30th. Brixen/Bressanone has nine concerts on July 2nd, ranging from Matthias Loibner on jazz hurdy-gurdy to singer Ángela Tröndle with cellist Sophie Abraham. There’s something about the mountain air in Suedtirol. It’s a wonderful place to hear such innovative music, so imaginatively programmed: 80 gigs in 10 days in 60 locations. From Verona, it is only a short train ride up to Bolzano. 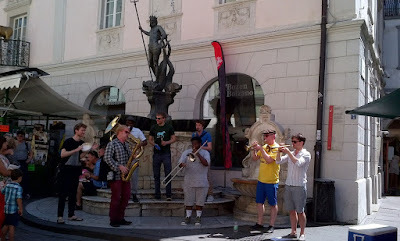 Concerts are from 15-25 euros, but a large number of gigs are free, and there are also discounts for under 30s. It's a great festival indeed. Not least because Klaus Widmann picks a country or city as a leitmotif. Thus last year it was London (curated together with Kit Downes and Ruth Goller). This year the country focus is Austria. So many of the bands are linked to a really exciting vibrant young scene that I myself have been discovering over recent months. Also to mention are the beers at the festival's 'HQ' (the Batzen microbrewery) and the wines, many of which we don't know here, such as Lagrein.